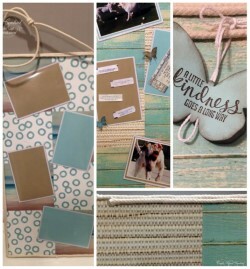 Just Julie B's Stampin' Space: Serene Scenery Magnetic Board Gift Set! Serene Scenery Magnetic Board Gift Set! A simple sheet of steel can easily be transformed into a beautiful two-sided magnetic board for hanging your pictures and keepsakes! This Serene Scenery Magnetic Board Gift Set includes a two-sided magnetic board, decorative magnetic photo pockets and a coordinating gift tag. Find out how to go from hardware store to home décor in this fun tutorial! This fun project was made by Michelle Wecksler and this is the Bonus Project for the month of November on Craft Project Central. Bonus projects can be obtained by subscribing to two or more months in a row, putting the Craft Project Central badge on your blog, or by referring a friend and when they subscribe, letting us know. Christmas Fun for Stamp Class! Ho! Ho! Ho! Santa Greetings! 3rd Birthday Card for a Challenge! Christmas Fireplace Box & Card Set! Be Merry Banner Gift Set! Christmas Cookie Cutter Tags & Matching Gift Box! Forget Me Not Perpetual Calendar & Cards! ‘This Christmas’ Trees & Treats Decor! Mixed Media Canvas & Pencil/Tool Holder!